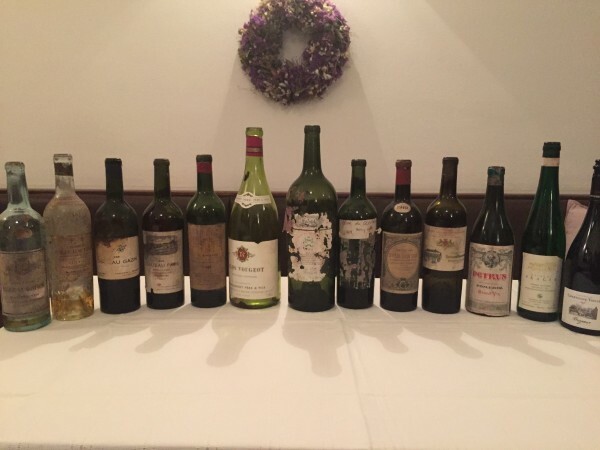 The idea to arrange this dinner was formed when I received an offer to buy a magnum of 1949 Mouton Rothschild from John Avery's legendary cellar just before christmas. Two friends who were with me then suggested that four of us buys it together and celebrate it over dinner. I expanded on the idea and added a range of other 1949s from my own cellar. 1949 is the year of my birth so I had collected a number of bottles over the years. We decide not to serve more than eight glasses per wine so that we would have sufficiently to enjoy. The plan was to start off with MM Scharzberger Sekt, a german sparkling wine. There had been some leakage over the last years so we didn't expect it to be drinkable at all. Surprisingly it still showed some life and fruit. We had some bottles of the fabulous champagne 2008 Les Orizeaux from Chartogne-Taillet as aperitif. The dinner at the excellent Restaurant Fuhrmann in Vienna started off with a youthful Ch. Laville Haut Brion and a charming Ch. Bastor La Montagne with fish. The Laville Haut Brion (now named La Mission Haut Brion Blanc) showed typical Graves lanolin and complexity and could pass for a thirty year younger wine. The Bastor La Montagne from Sauternes had lost some of its sweetness over the years and could pass as a Spätlese. The first red wine was a bottle of Domaine de Chevalier showing classic Graves character with some earthiness and very good fruit and style. Still so young. This was paired with a bottle of Ch. La Gaffelière bottled by Thienpont. Softer fruit and lots of seductive charm. I am a great fan of old La Gaffelières. Both fantastic wines showing the distinct characters from their terroirs. This was followed with two more St. Emilions - both having recently been promoted to Premier Cru "A" status. The Ch. Angelus showed some of its sweetness but also some oxidisation. The Ch. Pavie on the other hand was a fabulously powerful wine with great fruit and structure. I have had the great fortune to drink a large number of wines from the cellar of my friend, the late John Avery, over the years and never did he present a badly stored bottle. So when I got the offer to buy the magnum of Mouton I also bought a magnum of Clos Vougeot, Remoissenet. This was probably the best burgundy I ever had in my life. Sweet and silky and absolutely charming. A great wine! Now to the star attraction of the evening - the 1949 Château Mouton Rothschild. This is a wine that I have had several times over the years and it has always been one of my two greatest wines (the 1945 Mouton being the other). I have had this from John Averys cellar in the normal sized bottle before so I had great expectations in this magnum. It surpassed my high expectations and brought happy smiles all around the table. This was Philippe Rothschilds favourite wine and I can understand why. It is not quite as bombastic as the 1945 but more elegant. Absolutely wonderful. More than one of our guests commented that the two magnums were the best wines they had ever drunk. I had been offered a curious bottle of Pétrus from a befriended wine merchant who told me about having had this bottling of Pétrus twice from the same cellar and it had been fantastic. It had been bottled in a burgundy bottle by an unknown source - not that uncommon at this time. It showed lots of sweetness but sadly also lots of oxidisation. I had luckily brought two reserve bottles with me. The Ch. Gazin was fresh and very good. The best part of Gazin was sold to its neighbour, Pétrus, in the late 1960s and I am a great fan of older Gazins. The second reserve bottle was Ch. Calon Ségur - a very good wine. Calon Ségur made some of its greatest wines in 1945, 1947 and 1949. All in all this showed that 1949 rightly counts as one of the greatest vintages of all time. I hope that I will age as well as some of these wines.